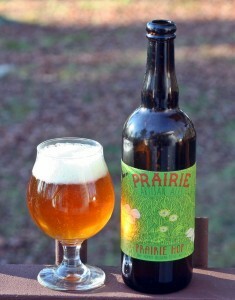 I’m becoming a big fan of Prairie Artisanal Ales. It took me a while to even try their beer but since I did I have not had a bad one yet. Hop is still a saison but hoppier than most. Pours a great orange color with a very thick white head. Aroma is a nice mix of hops, earthy spice. Taste has a lot going with plenty of hops that are kept in check by the peppery spice and saison yeast. Really interesting to mix the hop with the saison style to create something different, complex and tasty. Brewers Description: Prairie Hop is our hop driven saison. This beer is packed with Simcoe and Citra hops. Notes of peach, mango, and tangerine can be found in the flavor and aroma of this beer. The beer finishes dry which helps the hops jump out of the glass flavor wise.